Welcome to our review of the Covidien Kendall Antifungal Cream. This product is used primarily to treat fungal infection on the feet such as jock itch, athlete’s foot and ring worm. This anti-fungal treatment is also hypoallergenic to ensure that your skin will not get any irritation from use of this product. To know more about this cream please read our in-depth review below. To effectively use this product, first you must thoroughly clean the affected area with soap and water. Make sure that you dry it off completely, once dried you can apply a thin layer of this cream over the affected area. Be sure to do this 2 times per day. For athlete’s foot make sure that you also apply the cream to the space between the toes. It will usually take at least 4 weeks for result to take full effect. Jock itch will usually be treated within 2 weeks of using this product. As always, be sure to check with your doctor if condition persists even after a month of using this product as treatment. This product is hypoallergenic, hence, it is extremely safe to use on the skin. There are no known side effects to using this product. Of course, it is important to take note of any irregularities after using this ointment. If there are any irritations experienced upon application of this cream please immediately stop using the product. As of this moment there are no recorded negative side effects attached to using this anti-fungal cream. 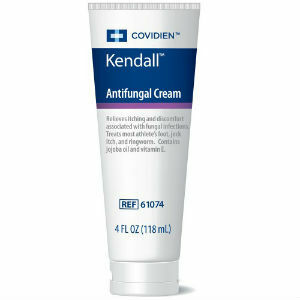 The Covidien Kendall Antifungal Cream is currently priced at $6.99 per 118 ml tube. There is also a 12 pack supply package but it is currently not available on the official website. You can purchase this anti-fungal cream from several reputable online shops, some may even offer discount coupons. At the moment there are no guarantees available with the purchase of this product. This could be a cause of concern for customers who find that this treatment is not effective for them or worse, it causes some negative side effects. While reviews of the product are positive we are only talking about a few testimonials that we have gathered online. This might be one of the safest anti-fungal creams around as it is hypoallergenic, which mostly eliminates the chances of side effects. It is also quite affordable and does have some solid reviews online. However, it must be noted that there are only a handful of these reviews and the lack of guarantee is worrying as customers are not given any money back guarantee if the product does not show any positive results. Ron Baker	reviewed Covidien Kendall Antifungal Cream Review	on November 23rd	 and gave it a rating of 3.